You are here: Home / Recipes / Desserts / Healthy desserts / Sugar-free Pure Fruit Popsicles: ZERO Food Waste & ZERO Weight Watchers Points! Sugar-free Pure Fruit Popsicles: ZERO Food Waste & ZERO Weight Watchers Points! It was only day 2 as a mother of two and I was already failing miserably. Being a new Mom is hard and scary, but when you’re second comes along, those feelings are only amplified. However, what you learn very quickly as a Mom is that popsicles make almost everything better! And these homemade fruit popsicles are the BEST because they are not only sugar-free, they are zero food waste and zero (0) weight watchers freestyle smart points! 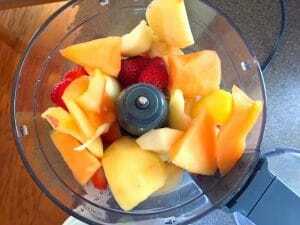 The bonus is that you get to use up your overripe and spoiling fruit! I had only given birth less than 48 hours before and yet, here I was, at the park with my toddler son and husband. And as my 22 month old came careening over the side of the slide, little did I know, I was about to embark on one of the biggest trips of my life – the guilt trip. Another thing you learn very quickly as a Mom is that motherhood is one very long guilt trip. You will eventually feel guilty about pretty much everything. And that includes food and whether you are feeding your kids healthy enough. But one food you don’t have to feel guilty about is these popsicles. Your typical popsicle is full of sugar, as are popsicles made with juice. So, I’ve made these zero food waste, pure fruit popsicles with my spoiling and/or leftover fruit. Sugar-free + zero food waste + zero weight watchers points = guilt-free! And that is one good feeling! Although you may buy lots of fresh fruit with the best intentions of eating it, life gets busy! Have you ever come home to this? It happens to me all the time…. What to do with fruit that’s going bad? I hate food waste and I feel like I deal with too much of it. So, if you’ve ever wondered what to do with fruit that’s on the verge of spoiling or overripe, make these homemade pure fruit popsicles or fruit ice pops. Not only do they save on waste, they are better for you! And you can use any of these in this recipe. Read more about fruit and weight watchers smart points HERE or HERE. And it wasn’t just the boy’s snot and tears that DH had to deal with, I couldn’t stop blubbering. Although I was pretty emotional to begin with, it was the guilt that got me. I was already a Mom, so guilt was not a new concept to me, but this experience took it to an entirely new level. However, I now realize that my son’s tears probably had more do with him feeding off of my extreme distress and panic, than being really hurt. This became pretty obvious when, not long after our arrival at the Children’s, they gave him a popsicle and miraculously, everything was all better in his world. When life gives you spoiling fruit, make popsicles! Since you already have enough to feel guilty about, you shouldn’t have to feel guilty about wasting food and money as well. So, when you end up with a bowl of 1/2 spoiled fruit, join the club, grab your knife, cut off the bad stuff and make popsicles! See, popsicles really do make everything better! 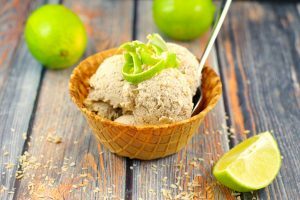 AND… if you are looking for more frozen summer treats that prevent food waste, give my Coconut Lime Nice Cream a try. You get to use up all those overripe bananas, it’s vegan, super healthy and as an added bonus, it has rum in it! OR my 5 Minute Weight Watchers friendly Rocky Road Froyo Bark can extend the life of your yogurt that’s just about to expire! These Homemade Sugar-free Pure Fruit Popsicles are not only zero (0) Weight Watchers Freestyle Smart Points, they are zero food waste. 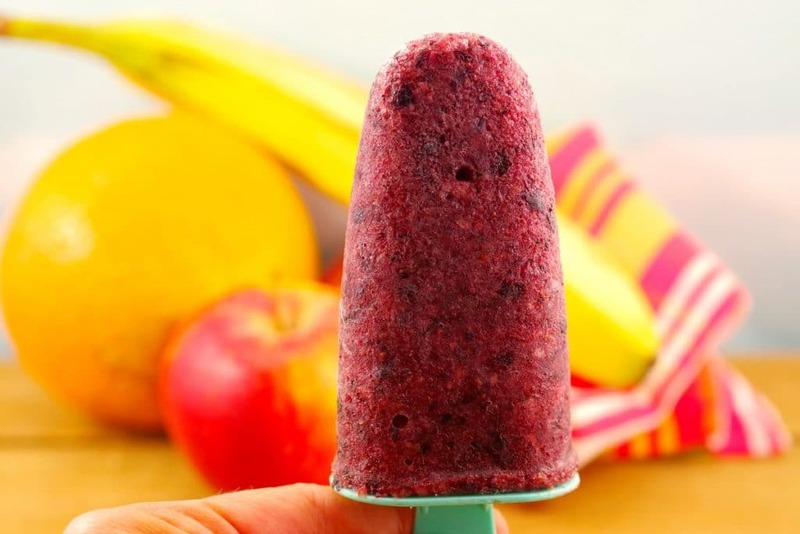 Use up your spoiling and/or overripe fruit and make these ice pops into popsicle or fruit cubes, which are great on their own or in smoothies! Cut off bruised, spoiled parts of fruit. 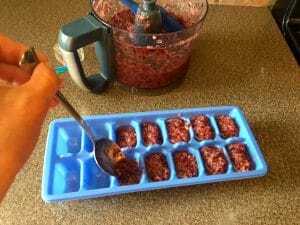 Pour into popsicle molds or ice cube trays (add large toothpicks to ice cube trays as shown in next photo) if desired. Freeze for at least 6 hours or overnight (until solid). Previous Post: « Easy Potatoes Romanoff (with slow cooker option): The Ultimate Potluck Dish! Always loved popsicles and definitely do not like food waste, so that is a win-win in my book. Yours are also sugar-free! I do need that sometimes 🙂 . They look so good and refreshing! Also, such a nice story 🙂 . Hi Nicoletta: Thank you! They really are tasty and so guilt-free! So glad your little one was OK. These are an easy, tasty summer treat, and I love that they are guilt free in so many ways. Now I won’t be composted over ripe fruit! Thanks, Colleen. Yes, at the time it was traumatic, but he’ll be 13 this year and everything is so much clearer (and less emotional) in retrospect! Love the idea of using spoiled fruit…because who doesn’t have some of that sitting around? These look great! Thanks, Lisa! Yes, sadly, I always have spoiling fruit and these are really yummy! Yay for zero waste! This is such a good idea for fruit that is looking a little sad. Love this fruit popsicles idea! Thanks, Denise… Yes, guilt trips are definitely a guarantee motherhood! Thanks, Nathalie – hope you like them! What a great way to use up ripe fruit! I’m very much in favour of feeding children naturally yummy things such as fruit. I also think it’s very impressive that you were able to go to the park with 2 days of giving birth!